Everyone is a buyer of something, so everyone is a customer. It is doubtful that anyone would say they enjoy a bad customer service experience, yet few people who work with customers go out of their way to provide excellent service. Think about these situations from the perspective of a customer. It doesn’t take much for a customer to decide that you and your company aren’t worth his time, effort, or money. One bad customer experience can cost you that customer for life. Hospitality, travel, retail, healthcare, and financial services are especially prone to losing customers who have a negative experience. Two-thirds of your business should come from existing accounts. Profiles International found that assessing core personality traits, combined with a standardized set of skills, provides clear indicators of probable success in a customer-facing role. In 1987 Profiles developed the Customer Service Knowledge Scale for the largest cable television provider in the US to successfully identify ideal job candidates for call centers, customer service departments, help-desks, and technical representatives. This research has been continually refined over more than two decades, with thousands of clients and across hundreds of industries. An employee who trusts her employer will work out a solution that is amenable to all parties involved, rather than try to justify herself to the customer. Tactful employees don’t offend customers and are able to be discreet, diplomatic, and restrained. An employee with high levels of empathy will understand the customer’s feelings and will make the customer feel like his concerns are valid. The optimal degree of conformity for your customer-facing people really depends on your business. The key is to understand your customers’ objectives and expectations, and then align your people with your customers. 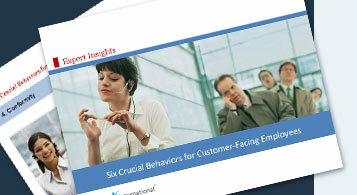 Highly focused employees will stay on task regardless of distractions, and will be attentive to customer’s needs. Highly flexible people tend to explore new approaches to doing things, and they are often described as adaptable, accepting, and open-minded. In both good times and bad the lifetime value of a customer can be exponentially greater than the value of a series of single transactions from one-time customers.